Serve your friends, or coworkers a bottle of assorted Game of Thrones Beer at your next party, or after work get together. 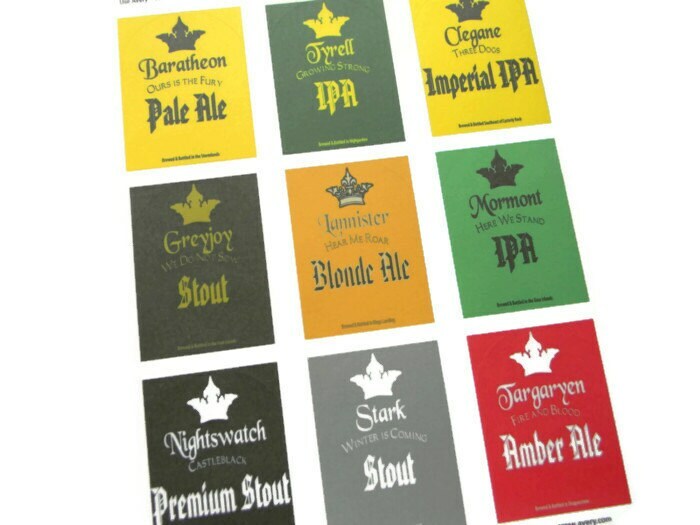 Every order includes one label each of Baratheon, Tyrell, Clegane, Greyjoy, Lannister, Mormont, Nightswatch, Stark, and Targaryen. These labels are the same design as the beer coasters you love already. These beer labels bring happy, and sad feelings as I think about some of the scenes this year on Game of Thrones. You had the celebration of the purple wedding with King Joffrey being poisoned, Olenna being the mastermind, The Hound going from a hated character to a favorite, Theon just going off the deep end, Jaime seeming like he has a heart and growing on me, Jorah being unfriended by Daenerys, Sansa growing up and learning how the politics of the Game of Thrones works, and Bran finally reaching his destination.